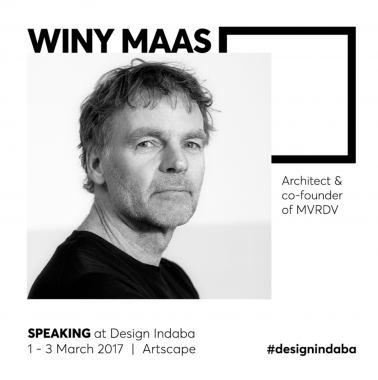 Winy Maas, director of The Why Factory, will give a lecture during the Design Indaba Conference next March 2017. The Design Indaba Conference is a yearly 3-day showcase of the world’s best creative minds, providing endless inspiration, new perspectives and universal solutions. The Conference has been the highlight of South Africa’s creative calendar since 1995, and has not only contributed vastly to uplifting the South African design sector, but has also been named the best design conference in the world. For 2017, the Design Indaba audience can look forward to a stellar selection of speakers with compelling multimedia presentations that combine performance, storytelling, career-changing insights and the most cutting-edge creative work on the global circuit.